A preliminary autopsy report shows that a Palestinian teenager believed to have been murdered in a revenge killing was burnt alive by his kidnappers, a senior Palestinian official said late Friday. Attorney General Muhammad Abd al-Ghani Uweili told the Ma’an News Agency that Mohammed Abu Khdeir’s autopsy showed soot in the victim’s lungs and respiratory tract, indicating he was alive and breathing while he was being burnt. News of the autopsy and a new volley of rockets which fighters in Gaza have launched into Israel on Saturday follows a day of clashes on Friday between Palestinians and Israeli police before and after the emotionally charged funeral of the 16-year-old in his East Jerusalem neighborhood of Shuafat. Sporadic fights reportedly continued into the night in East Jerusalem and spread to other towns, according to the Times of Israel. Around the central town of Qalansuwa, angry Arab Palestinian protesters stopped traffic, attacking Jewish drivers and torching their cars, public radio reported. The road to the town, in the Triangle district close to border with the occupied West Bank, remained closed on Saturday as sporadic protests continued, police said. Israeli Foreign Minister Avigdor Lieberman condemned the protests by Arab-Israelis. “It’s good the police arrested the Arabs who rioted yesterday [in Israel’s north],” he wrote on his Facebook page on Saturday. His remarks have been condemned by Meretz party head Zahava Galon, who accused him of “inflaming hatred between Jewish and Arab citizens of Israel and, in so doing strengthening the winds of racism and nationalism,” according to Haaretz. Reports and photos have also emerged Saturday of the arrest of Abu Khdeir’s cousin, Tariq Abu Khdeir, after he was allegedly beaten by masked Israeli police on Thursday evening, also in Shuafat. The 15-year-old, Palestinian-American was reportedly visiting from his home in Tampa, Florida, according to Electronic Intifada. A court hearing is schedule for Sunday for the teenager who is reportedly being held without charge and denied medical treatment, his family and the rights group Addameer told Electronic Intifada. On Friday, thousands of Palestinians took in Mohammed Abu Khdeir’s funeral. Chanting “with our blood and our spirit we shall sacrifice for the martyr,” mourners carried his shrouded body through Shuafat as flag-waving crowds thronged the narrow streets. Before and after Abu Khdeir was buried in a local cemetery, Palestinians clashed with Israeli police near the procession and elsewhere in annexed east Jerusalem. Thousands of officers were deployed in case of widespread unrest. It was the third straight day of violence since Abu Khdeir was kidnapped and found dead Wednesday in suspected revenge for the abduction and murder last month of three Israeli teenagers. Palestinians threw stones at police, who responded with “riot dispersal means”, spokeswoman Luba Samri said in a statement, adding that 13 police were lightly injured. The Red Crescent said 62 Palestinians were wounded in the clashes, one of them by a live bullet. The teenager’s funeral coincided with the first Friday prayers of the Muslim holy month of Ramadan. Despite the occasion, just 8,000 worshippers attended the prayers at Jerusalem’s Al-Aqsa mosque compound, Samri told AFP. Last year there were 80,000 worshippers there on the same day. The funeral came a day later than originally planned after the youth’s body was held for pathologists to complete a post-mortem. Israeli police say the motive for Abu Khdeir’s killing is still unclear. Meanwhile, military commanders waited to see if a series of statements by Israeli leaders promising to “meet quiet with quiet” would bring a halt to the latest flare-up of violence on the border with the Gaza Strip. Hamas said efforts were under way with Egyptian mediators to reach a truce after a week of rocket fire into southern Israel and retaliatory air strikes against Gaza. It is unclear which groups or individuals in the Gaza Strip launched the rockets to which the Isreali army retaliated. “There are continuing Egyptian efforts to return calm to the Gaza Strip, but no agreement has been reached yet,” a Hamas official said. The army reported that at least 14 projectiles were fired at Israel since Friday morning, one of them crashing down in Gaza and three intercepted over southern Israel by the Iron Dome defence system. On Friday night, Israeli warplanes attacked “three Hamas terror targets” in southern Gaza in retaliation for the “constant rocket fire at southern Israel”, the military said. Gaza medical sources said nobody was injured in the attacks. But a medical official said a Gaza farmer was in serious condition after being shot by Israeli soldiers near the border fence. An army spokeswoman told AFP soldiers had identified two men “meddling with an explosive device in the ground” in central Gaza and shot at one of them, identifying a hit. Israel warned Hamas Thursday to put a stop to rocket fire from its Gaza power base and sent army reinforcements to the border. 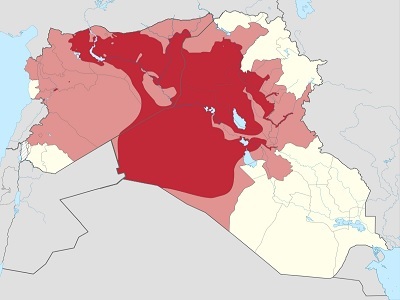 Islamic State in Iraq and Syria: Did Bin Laden Win?